I’ve been playing around with different techniques that add a third dimesion to quilts. Here is one that I was working on yesterday. I’m calling it crumpling. I don’t know if there is an “official” term for it. I’d like to know if you know of another name for it. It was very simple to do. 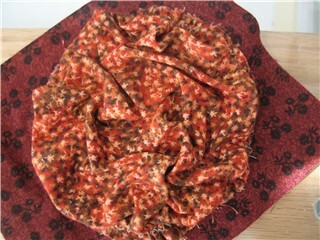 I cut out a circle of fabric about twice the size that I wanted the finished circle to be. I gathered the edge of the circle by my favorite method which is by zig-zagging over a thread which can then be pulled to gather. 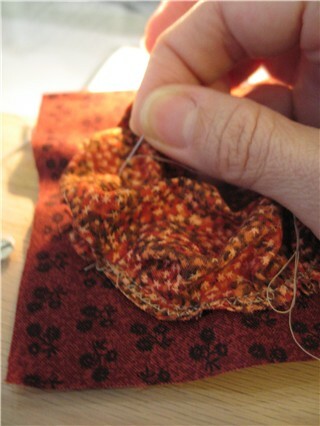 I gathered the edge in until it was the size I wanted it to be and sewed it in place on my foundation fabric. This left a puffy dome in the middle. I crumpled the dome down in the middle and hand tacked it in place. Then I went around the circle, pushing an area down and tacking in place and then on to another area and tacking it down in place. I was able to rearrange the valleys and hills as I wanted before tacking them. As you can see from this photo, I should have turned under, or finished in some way the edges of the circle before I sewed it in place. But it worked OK for this experiment. I imagine that this would work for other shapes as well; squares, triangles or even organic shapes. 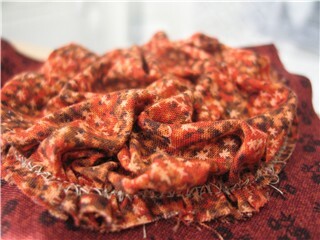 It adds some dimension to the fabric along with shadows, highlights and interesting texture. Kind of a hybrid between a yoyo and a biscuit block–Lois Ericson has written a few books on manipulating fabric to make texture that are worth looking through or even buying. The books are circa 1980s so you can probably get them used cheaply. Looks like fun. I will have to remember to try it. I bet organza and tulle would look pretty done this way. I love the way this looks, Deb! This is something I want to try. Looks great, but have no name for it! 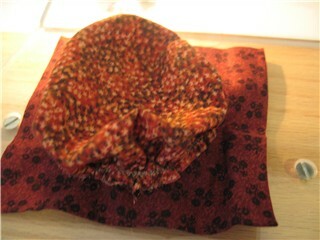 Hi, I love the idea it makes for an interesting finish, it reminded me of scrunchies I use in my hair. Looking forward to seeing what your next experiment is. This does look interesting. 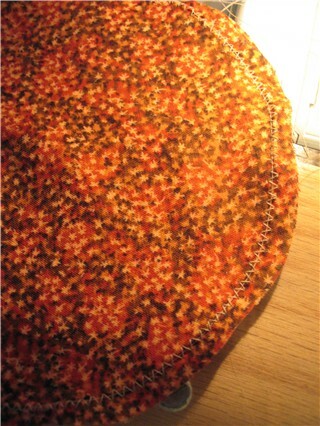 It would make a nice flower center if you did applique. Actually it’s called Rusching. You’ve gathered it by machine instead of by hand, which is the traditional way, but it’s the same. You cane also do strips of fabric to get a different look. My favorite book for all sorts of surface techniques, is Anita Shackelford’s 3 Dimensional Applique’ book. It’s full of all sorts of ideas, taken from her study of antiques quilts.